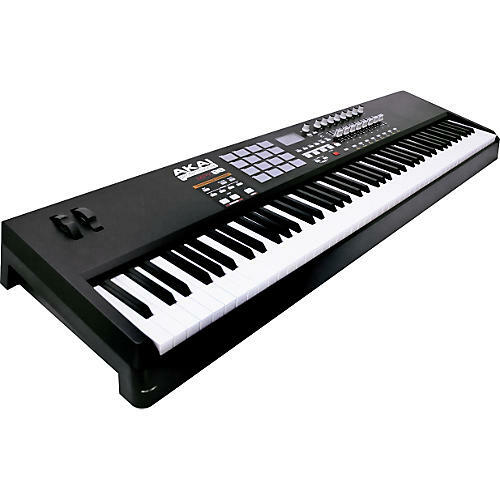 The Akai Professional MPK88 is a professional performance keyboard controller with MPC (Music Production Center) production controls. The MPK88 draws on the design of the popular MPK49, the first keyboard ever to feature MPC pads. This first-of-its-kind keyboard is ideal for performance, starting with a premium, fully weighted, hammer-action keyboard, adding MPC pads, Q-Link controls, and a selection of MPC technologies. The MPK88 is born for the stage and is equally at home in the studio. The Akai MPK88 features an 88-key keyboard and 16 genuine MPC pads. The hammer-action keyboard is fully weighted and features aftertouch for expressive melodic control. The MPC pads are pressure and velocity-sensitive to capture every nuance of your creative concepts. The pads can access four banks of sounds, so you have 64 samples at your fingertips with the touch of a button. The MPK88 USB MIDI Controller places dedicated transport controls within your reach for easy manipulation of some of the most important tracking and editing controls. The MPK88 has modulation and pitch-bend wheels for expressive musicality, and two assignable footswitch inputs enable you to connect an expression pedal (or other continuous controller) and a footswitch for momentary controls like patch change or start/stop. One of the most important input devices on an MPC is its Q-Link assignable control section. Akai Pro built a massive collection of Q-Links into the MPK series. The MPK88 keyboard gives you eight virtual knobs that are assignable to control nearly any software parameter. You can control three different parameters per knob thanks to the knobs' three-bank selection, totaling 24 parameters of instant, hands-on control. Like the virtual knobs, eight virtual faders and eight virtual buttons also control three banks of parameters each, so you get 24 virtual faders and 24 virtual buttons for a total of 72 Q-Link controls. Two technologies pioneered in the MPC series and built into the MPK series are MPC Note Repeat and MPC Swing. These note-modifying features can be heard in many popular tracks over the last two decades. MPC Note Repeat is a capability that enables the MPK (or MPC) to automatically play a rhythm pattern, such as 16th notes on a hi-hat, for accuracy and speed of entry. MPC Swing is sometimes referred to as "the heart and soul of hip hop" because it turns perfectly aligned sequences into human feeling time alignments. You can specify exactly the degree and timing of swing you want to apply for the perfect feel. The Akai MPK88 has Key Split, enabling you to control two different sounds from the same keyboard. On top of MPC technologies, the MPK88 has its own arpeggiator, which enables you to create quick, creative riffs in seconds. Just pick a note or chord and a rhythm pattern in the arpeggiator's library and the MPK will play your notes in the rhythm and sequence you choose. The MPK88 USB MIDI controller also has MPC Full Level and MPC 16-Level on its pads, as well as Tap Tempo and Time Division so you can nail the tempo, timing, and dynamics exactly as you hear them in your head. The Akai MPK88 is a MIDI controller that sends its MIDI values over USB. It is bus powered, so all you need to connect and power the MPK88 is the supplied USB cable. Because it is MIDI compliant, the MPK88 works with most MIDI recording, sequencing, and performance software for musical performers from keyboard players to producers to DJs and even VJs. The MPK88 comes with Ableton Live Lite Akai Edition, one of the most popular and powerful performance and production programs in the world. Ableton Live Lite enables musicians to spontaneously compose, record, remix, improvise, and edit musical ideas in a seamless audio/MIDI environment. Hit the stage with an incredible keyboard designed to enable you to perform the way today's music is made.